ITP SS112 Sport Machined Atv Wheels - 9" & 10"
Great product that was exactly as advertised. Great Customer service. They even shipped lug nuts, valve stems. The wheels are working great on my ATV! 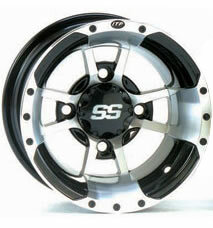 Awsome rims, I have a Yamaha Raptor that is dark & light gray in color and these rims made my quad look sweet! The shipping was super fast to, I ordered them on Sunday & they were on my door step on Thursday!! Wow!! Q: I need these wheels to fit a 2007 kawasaki 700. My tire size is front:22x7x10 and rear: 22x11x10. Can u fix me up with these wheels to fit my current tire size, and make/model/year of ATV? A: Unfortunately this rim is not offered in the bolt pattern you need for the rears. I can get you fronts for your machine but not the rears. Q: will you have zero offset wheels? A: In this style no, we do have some other larger size rims that have zero offset. They are offered in 14, 15 & 16 inch sizes for the full size 4x4 atvs. 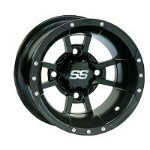 Q: I wanted to know if these style will fit a 2005 Suzuki ltz250 quadsport or if the all black ones will work? A: Yes these fit your machine. You need 10x5 4/144 for the front and 9x8 or 10x8 for the rear with a 4/110 bolt pattern. Let us know if you have any other questions. Q: I have a 4 lug hub measures 3 inch center to center straight across will these fit ? A: We need to know center to center between 2 studs diagonally. Not Straight across. Let me know and I'll see if this wheel is offered in the size you need.